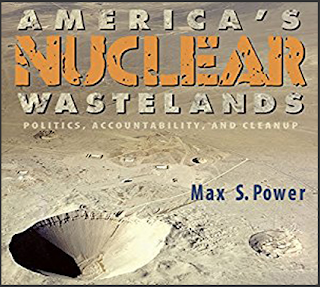 America's Nuclear Wastelands certainly has an intriguing title, and a picture of several atomic bomb craters on the cover. The subtitle is "Politics, Accountability, and Cleanup" but while accountability is discussed several times in the book, liability isn't mentioned at all. It's mainly about politics, which the author thinks is the main reason nuclear waste is a problem at all. He claims states have "significant" say over nuclear waste regulations, then admits they don't, then asserts they do again (pgs.33&34). Correct answer: They don't. The agreement concluded earlier this week between Southern California Edison and Citizen's Oversight is a complete waste of activists' energy -- or worse. It accomplishes nothing but to assuage the fears of the most poorly-educated "Interested Parties." It does not protect California, it does not put a single dent in the nuclear industry or Southern California Edison's profits (the money for the agreement will come out of ratepayer's pockets). In fact, in gives the nuclear industry a go-ahead to keep on creating nuclear waste and confirms that concerned citizens can be hoodwinked -- along with their lawyers. Not only that, but those citizens who signed the agreement have -- in writing -- the "affirmative duty to support the settlement and its costs" before the California Public Utilities Commission, by "offering testimony in support of a CPUC application to approve costs associated with the transportation and storage of SONGS Spent Fuel." In other words, the approximately $4 billion dollars that ratepayers have ALREADY put into the "decommissioning fund" will NOT be used for offsite storage costs, or costs of transportation thereto. Ratepayers will be expected to pay those additional costs -- whatever they may be, and however long they last. Not one citizen ever signed on to centuries of cost burdens for storing nuclear fuel that is no longer "commercially reasonable" to use. "Commercially Reasonable" is a phrase that comes up often in the agreement: It means SCE can do nothing if the cost is too high, and does not need to balance potential risks against cost benefits -- if a transportation and offsite storage plan meets the minimal Nuclear Regulatory Commission standards for safety -- standards which are way too lax -- SCE can do it if they want to, but don't have to if the cost is too high by some "Commercially Reasonable" standard they can make up as they go along. SCE can -- and will -- just let the waste sit where it is, on the beach, letting salt corrode the containments day by day, for decades or even centuries. Until long after they're out of business. Moving the waste to another location is NOT a solution to the nuclear waste problem. It's a transference of risk, and according to the agreement, must also include a transfer of liability. In fact, it's worse than no solution at all: The agreement enables other old, corroding and decaying nuclear power plants (such as Palo Verde, Diablo Canyon, Indian Point and more than 90 other operating old reactors in America) to claim they've "solved" the waste problem and keep operating, and keep making more waste, and keep transferring liability to others. When the plants were built, the public was assured the waste would be removed as soon as it was cool enough to transport -- about five years at the time, although the more highly enriched fuel used by most reactors today generally requires even longer. The spent fuel pools (every reactor has one) were made to accommodate only about five years worth of highly toxic (radioactively) and exceedingly hot (thermally) spent fuel under 40 feet of water. A new spent fuel pool today would cost nearly a billion dollars. The years went by, and there was still no place to put the waste. And America didn't need to extract plutonium from the "spent" nuclear fuel for bombs anymore (we have more than enough of that already for the thousands of nuclear bombs we still maintain). In any case, reprocessing proved too expensive and too polluting to bother with when mining uranium (and poisoning uranium miners) was (and is) cheap in comparison to reprocessing costs. So the utilities just started packing the spent fuel tighter and tighter together in the pools at each nuclear power reactor site. When the pools couldn't accommodate any more spent fuel, the reactor companies turned to "temporary" dry cask storage. Dry cask storage is MUCH cheaper than building a new spent fuel pool. Whether it is safer is highly debatable, but even if it is in some ways safer, on the other hand, by enabling the reactor to keep operating and create more and more spent fuel, any conclusion that dry cask storage is safer than pool storage per ton of fuel is counterbalanced by the increased amount of fuel that must be stored -- and by the operating reactor itself, as well as the higher risk of recently-removed fuel compared to older fuel. But dry casks, like spent fuel pools, was only supposed to be a "temporary" solution so the reactors could keep operating. For about 20 years the dream -- the nightmare -- of Yucca Mountain has been used as an excuse to keep the plants open while the waste piles up, even when reactor pools have been reracked three or more times (creating extremely hazardous conditions in case of a loss-of-water accident or sabotage). Dry casks pile up around the reactor. For 20 years any activist who said: "But what about the waste?!?" was simply told: "Yucca Mountain." Yucca Mountain was stopped -- but NOT because of political infighting -- that's the lie the nuclear industry wants you to believe. No: It was stopped because there were more than 300 problems Nevada scientists had identified (many completely unsolvable, such as earthquake, volcano, and water intrusion problems) and several dozen more problems that California scientists had identified (including downstream radioactive pollution from underground water movement after an accident). Another HUGE problem with Yucca Mountain, which will be at least as big a problem anywhere else, was that almost nobody in Nevada wants it, and they've fought against it vigorously for years. So too with proposed "Interim" storage sites in New Mexico and western Texas. A few local residents expect to find high-paying jobs -- mostly in management -- but other than that, nobody wants somebody else's nuclear waste. One of the proposed temporary storage sites, as described in the agreement, was Arizona's Palo Verde Nuclear Power Plant, which is part-owned by Southern California Edison. But the day after the announcement of the settlement, PVNPP released a statement they had obviously been holding until SCE gave them the go-ahead: They would NOT be taking anyone else's nuclear waste. Palo Verde already has storage plans for roughly 200 canisters which are currently being filled -- and plenty of room for more -- but they don't want the added liability, and probably know perfectly well they'll be stuck with the added waste forever if they take it. It's just a simple business decision for them, but puts 50 million people who live near San Onofre in danger -- or rather, keeps them in danger. The nuclear industry as a whole absolutely opposes transferring nuclear waste from closed reactor sites to still-operating reactors (where the many risks from the operating reactors far exceed the added risk from the spent fuel, by several orders of magnitude). If it became a standard practice, dozens of reactors would shut down immediately rather than become de facto "Interim Storage Sites" for other reactors. This would of course be good for the nation for reactors to close, and would save millions of dollars in costs: For specifying new sites, for security, and for maintenance. Only closing ALL the reactors would be better. But the industry, of course, opposes it. Meanwhile, the waste at 100 operating reactors around the country continues to accumulate. Each dry cask nuclear waste storage container is huge, but only about 1/2 inch thick of so-called "stainless" steel, weighing (together with its contents) at least two hundred thousand pounds. The containers are liable to rust, causing "stress corrosion cracking" (SCC). They cannot be inspected (or even safely approached). There are now about 2,000 dry storage canisters in America, each one vulnerable to airplane strikes (accidental OR on purpose), explosive charges, and degradation as the years go by. The only real solution is to stop making more nuclear waste. Any effort at neutralizing the uranium and plutonium -- possible through a patented process -- still leaves -- and in fact creates more -- fission products, which have relatively short decay periods (half-lives of about 30 years or less in most cases) compared to plutonium and uranium. These short half-lives mean the resulting waste is much more hazardous if it gets out (especially because some of it (cesium, for instance) bioaccumulates), but it is hazardous for much less time. Plutonium is hazardous for about a quarter of a million years. Most fission products are hazardous for 600 years or less. The biggest advantage of neutralization -- besides reducing the storage time from hundreds of millennia to half a dozen centuries (still more than twice as long as the United States has existed as a country) is that it eliminates the possibility of a criticality event. Criticality events are possible with spent fuel because in a fire or accident, the fuel pellets can become rearranged to the point where radioactivity suddenly sharply increases, causing a devastating thermal explosion. It's not a nuclear bomb, but it can spread fine particles of radioactive waste over a wide area and for hundreds of miles downwind. Moving San Onofre's waste away from the coast, away from 50,000,000 residents, sounds like a great -- and simple -- idea. But nothing in the nuclear business is what it seems, and nothing is simple. There are numerous unsolved problems which apply to ALL sites: just moving nuclear waste from one place to another is extremely risky: Not only because of terrorism and infrastructure issues -- the roads, rails and bridges in America are in terrible shape, and the terrorists have access to drones and powerful (and extremely HOT) explosives. You cannot hide a slow-moving train or truck convoy. There are only a few roads and rail lines that can be used, so the routes are well known. The canisters they propose to use for transport are incapable of withstanding numerous accident scenarios, such as oncoming train collisions, exploding fuel trucks nearby, bridges falling on top of them or out from under them, etc. etc.. Some activists who support the NIMBY solution (Not In My Back Yard, aka: "get it out of here, I don't care where it goes") have pointed out that "the military moves nuclear fuel and waste all the time." But that doesn't tell the whole story. First of all, they can get away with far less safe procedures since they aren't regulated by the civilian Nuclear Regulatory Commission (for what it's worth). Additionally, the military is dealing with much lighter amounts -- hundreds of pounds at a time instead of hundreds of THOUSANDS of pounds at a time. A nuclear submarine is NEVER refueled during its life and transports itself most of the way to the "final" resting place for the fuel, while nuclear aircraft carriers are refueled only once. Military nuclear fuel is U-235 enriched to nearly 20 times the level of commercial nuclear fuel (4 to 5% versus about 80%). The electricity military propulsion reactors must produce is in the tens of megawatts, far less than the 1,100 megawatts of a typical commercial reactor, so they can be much smaller. Thus, the total amount (by weight) of each military spent fuel shipment is correspondingly far less. Bombs are even smaller and more highly enriched perhaps as much as 95% U-235 and Pu-239). Nevertheless, a area in Spain is still highly contaminated with plutonium from a military plane crash in the mid 1960s, and one that accidentally fell in North Carolina in 1961 had five of six safety systems fail...one left. Another one, an H-bomb lost off the coast of Georgia in 1958, was finally found in 2004 -- but can't be moved. There have been many other incidents and near-misses with the military moving nuclear materials. Some incidents, undoubtedly, have never been made public. Commercial nuclear waste being transported in America has ONE safety system that might remain intact: The outer steel transport container. Everything else is highly suspect and shouldn't be relied on at all. Some of the zirconium fuel cladding in every container are sure to be cracked already (each container contains nearly ten thousand fuel rods in as many as 37 fuel assemblies (or "bundles), and close to a million fuel pellets). The thin 1/2 inch inner dry storage cask cannot be inspected (especially on the INSIDE) and may be cracked after sitting in a damp, salty environment for years if not decades. The outer steel transport container is to be reused possibly hundreds of times over tens of thousands of miles. So it may already be damaged by the time an accident it was designed to survive happens. And those accidents -- the ones the transport cask is designed to survive -- are minor compared to what might really happen. For example: Fires surrounding the cask in an accident are expected to burn for not more than about 20 minutes. A drop onto a post is expected to be from not more than about 30 feet, and the post it lands on is expected to be not less than four inches in diameter. If it falls in water, the depth is expected to be less than about 50 feet. None of these (and many other) standards are good enough. And the NRC's federal rulings on nuclear safety cannot be strengthened by individual states wanting more stringent regulations. The feds will come in and overrule any attempt by the states to regulate safety. All they are left to regulate is who will pay for it, and in California, it's invariably the ratepayers. This settlement deal is no deal at all, but a license for the utility to risk trillions of dollars in damages for many decades to come. The author has been studying nuclear issues as a private citizen for more than 40 years. He has seen dozens of spent fuel proposals come and go. This "agreement" appears to simply require Edison to spend up to but not more than $4,000,000 looking for offsite storage, which they were doing anyway. Pursuant to CPUC approval, SCE can charge the $4 mil to ratepayers. The key section is C1(c) which stipulates that relocation "must" result in the transfer of liability (unless SCE can come up with a "Commercially Reasonable" alternative). C1(e) further stipulates that SCE doesn't have to do anything if they can't get it paid for out of the decom fund or with fresh funds from DOE. Section D asserts that SCE can stop looking for a place when they use up the money or when they feel like giving up the search. In return, Plaintiffs dismiss their lawsuit, agree not to sue again (except if they feel this Agreement has been breached by SCE), nor to encourage anyone else to sue, and Plaintiffs will gleefully take $800,000 to the bank [termed legal "expenses" by the agreement]. In other words, it's all a big load of "quap". Note: "quap" is the term for nuclear waste originally coined by the great writer H. G. Wells, author of The Time Machine, The War of the Worlds, The Island of Doctor Moreau, The Invisible Man, The Shape of Things to Come, The Outline of History, The War in the Air and many other classics. The first step is to assume a worst case (and most likely) scenario that the fuel will be stranded at San Onofre indefinitely. The fuel must therefore be moved into the most robust fuel containment possible...10" - 19.75" thick cast iron dry casks. The second step is to imagine that the industry is going to ditch the fuel onto a smaller, politically weaker community than ours. Ethically and morally those along the transport route and those on the receiving end deserve the most robust fuel containment possible. That is not the fuel containment system that any one of us is getting at the moment. We must fight for the safer, thicker, monitored, containment casks and protect the receiving community as if they are our extended family members. Note #1: Attorney Mike Aguirre immediately "unsubscribed" from my list after receiving this newsletter. Note #2: Donna Gilmore assures me that the NRC does have jurisdiction over the military nuclear waste shipments. I'm not sure, perhaps they have "review status" or something. They certainly do not inspect shipboard reactors or bombs! Also, there are already over 200 dry casks at PVNPP. And lastly, she reminds me that the casks will corrode anywhere -- just probably faster near the shore.